As a kid I used to wander the empty fields of my south Florida neighborhood, the bible according to Euell Gibbons in hand. His book, Stalking the Wild Asparagus, was my first field guide to a life-long love of foraging. The native flora of southern Ohio offers plenty of edibles, such as wild ramps, a delicacy similar to leeks, pawpaws, spicebush berries, and fiddleheads of ferns. But I’ve made an ethical choice not to harvest plants from the delicate forest understory. Too much of the land has been trampled and intruded upon by us humans, and I’d rather turn to less imperiled areas already disturbed by human activity. (I’ll make an exception for fruits, since that doesn’t remove the whole plant: if I can do so without causing damage, I’ll harvest things like pawpaws or wild plums.) In short, I choose to eat weeds. There’s a botanical name for these plants: ruderals. The label refers to hardy species able to colonize disturbed ground – whether farmed fields or “waste” places. Many of the ruderals were introduced by immigrants over the centuries, who brought with them plants from their Old World homes. Whether maligned for growing as weeds in cultivated fields, or simply overlooked because they grow in vacant spaces, the following plants are abundant enough to provide staple greens throughout the growing season, and provide ample nutrition for anyone with the time to harvest. They are there for the taking, freeing you from the time needed for sowing and thinning and weeding the more familiar garden greens. The following handful of species can serve as a practical foundation and an easy entry to foraging for wild foods. A simple Internet search will turn up loads of information; here I’ll give a brief intro to each. Dandelion, Taraxacum officinale, superhero of the weed world, starts off the growing season. The presence of “officinalis” or “officinale” in its Latin species name attests to its long standing value in the European apothecary. The too-often maligned dandelion is considered by some a superfood, with very high levels of vitamin A, as well as a great source of vitamin C, folate, beta-carotene, antioxidants and minerals. As one of the first plants brought to the New World by Eurpoeans, iIt should be a staple in everyone’s diet. Leaves can be harvested early in the season when they are small, as bitterness increase quickly as the plants grow. You can blanch the leaves by covering plants with a layer of mulch or cardboard, or an overturned bucket. And the flowers make a delicious veggie burger, where flour and egg help to bind the bulk of yellow flowers together. I make a batch or two in the spring and store in the freezer, then pan fry throughout the year. 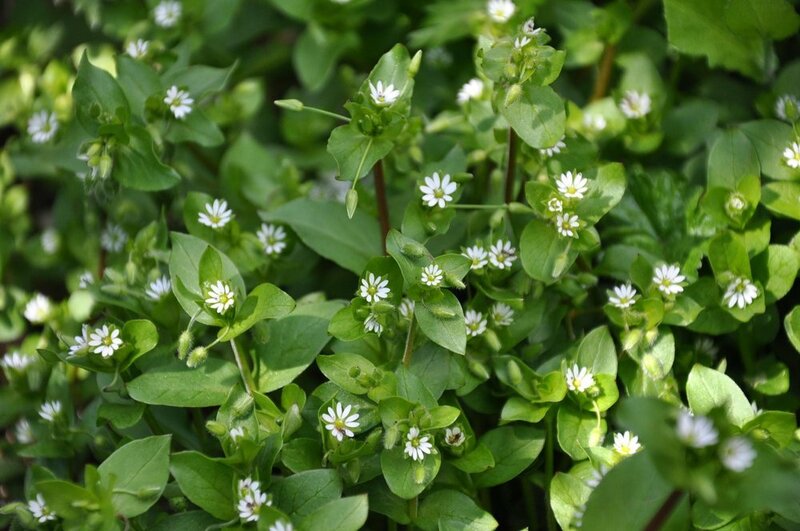 Another late winter/early spring offering to look forward to is Chickweed, Stellaria media, an introduced species that grows in clumps just about everywhere its seeds fall. I've seen it growing around telephone poles, along houses, and it can carpet the ground in my garden. This plant is one of the earliest to appear at the end of winter, and eaten raw it is a restorative shot of chlorophyll after a long winter. You can mix it into salads, or lightly steam it, or put it through the juicer. It has a somewhat grassy taste to my palate, so I prefer it mixed with other raw greens. Like dandelion this plant has medicinal uses as well. It’s valued as a part of Japan’s traditional Festival of Seven Herbs, celebrated on January 7. A bit later in the season the following three plants appear and their greens will be available until the end of the growing season. Redroot pigweed, Amaranthus retroflexus, is one of the many species of wild amaranth native in the Americas. Though native, it was not so commonly found until agriculture spread across North America, as it loves to grow in disturbed fields. Agricultural extension offices consider this plant a noxious weed. Its unfortunate name masks the fact of its high nutritional value and excellent flavor. I remember a Jamaican neighbor dancing with delight when she learned of this plant growing in my garden. She said it was the veggie used to make the traditional Jamaican dish, calaloo. I provided her with bags of it. It can be used as a substitute for spinach in any dish, and, like spinach, pigweed has oxalic acid in its leaves and should be cooked. Imagine if instead of trying to eradicate pigweed in favor of their cultivated crop, the farmers harvested it for market! It cooks up like spinach, becoming tender within a few minutes. I call this summer spinach because it’s super available when cool-weather-loving spinach’s growing season has ended. Another plant that’s easily found and easily established in one’s garden is Purslane, Portulaca oleracea - a low creeping, shallow-rooted succulent that will reseed itself from year to year. This native to the Mediterranean regions is in the cuisines as widespread as Turkey, Russia, India, north Africa, Mediterranean Europe, Mexico. The fleshy leaves and stems are excellent either raw or cooked. In addition to its high levels of vitamin C and minerals, it has high amounts of essential fatty acids and antioxidants. I like to munch on freshly picked purslane while working in the garden, and it’s also great sautéed and pickled. A Google search will produce numerous international recipes for preparing it. Last but far from least is Lambs quarter, Chenopodium album. This highly adaptable ruderal is thought to have been native to Europe but is now naturalized globally and valued. It’s related to spinach and beets and can be used as a spinach substitute. The leaves are more substantial than those of pigweed, so they're appealing to munch on raw. But they cook up quickly to a spinach-like texture and are excellent just steamed with a bit of butter. They make a great spinach substitute in a Korean spinach salad, a fabulous Indian saag, and a delectable spanakopita. The best thing about Lambs quarter is that it provides a generous ongoing harvest of leaves throughout the season. While most gardeners have to coddle their spinach, and then enjoy only while temperatures remain cool, lambs quarter is readily available with no fuss. In fact, I don’t bother to grow or purchase spinach knowing that I can depend upon this plant reseeding itself annually in my yard and garden beds. An easy way to guarantee a supply of these foods is to get some seed and establish them around your yard. Dedicate some space for weeds, and you’ll have an easy supply of greens most of the year. Once established, they’ll return reliably year after year. Karen Arnett is a former freight pilot and weather forecaster who loves to observe the natural world. She is a beekeeper and gardener and besides helping with the CORV Guide, she’s on the planning team for the Midwest Native Plant Society’s annual conference. She also helps plant trees in her community. Cincinnati will host the 9th Annual 2018 National Farm to Cafeteria conference April 25-27 at the Duke Energy Convention Center. The conference, organized by the National Farm to School Network, will offer speakers, smaller group informative sessions, in-depth short courses, and regional field trips. The event is a collective of innovators who have done the research and laid the groundwork for creating programs that benefit children, farmers, and communities throughout the country and worldwide. Two main organizations, The National Farm to School Network (NFSN) and Ohio Farm to School, are working on this conference. As a non-profit organization, NFSN, advocates and serves as a central hub of information for the local food movement throughout the country. The organization provides nutrition education to communities and encourages the relationships necessary for local food procurement. The many attributes of NFSN including innovative leadership, networking opportunities, and compilation of information have helped to create school gardens, agriculture education, and locally produced food to cafeteria programs in over 42,000 schools nation-wide. This organization recognizes the civic importance of food, and has been an invaluable advocate for the movement. Ohio Farm to School (farmtoschool.osu.edu) is a program through Ohio State University Extension. Ohio Farm to School provides our region knowledge and support regarding nutrition, agriculture and the connection to the community within Ohio. The OSU Farm to School program provides resources to preschool to college institutions by aiding in connecting key resources in our communities to create strong and lasting partnerships throughout Ohio. The National Farm to School Network and OSU Farm to School, along with other organizations have joined forces to propel the Farm to School movement. While the focus of the conference may appear to be farm to school, the information is applicable to nearly every institution concerned with the health and wellbeing of its community. It will be a great opportunity for public health professionals, teachers, school administers, food service workers, farmers, and parents interested in advocating for the health of our communities to network and collaborate. Topics and considerations of everything from farms and gardens to institutions throughout communities will be presented. Calling all Ohioans! Wednesday, April 25 3-8pm a pre-conference event will be hosted by OSU Ohio Farm to School and InFACT (Initiative for Food and AgriCultural Transformation) focusing specifically on farm to cafeteria within Ohio. Topics will include achievements, opportunities, challenges, and government policy concerning farm to school in Ohio. A dinner highlighting the bounty of Ohio will be included in the pre-conference. It will be a chance to have significant and progressive discussions regarding the advancement opportunities in our area. There is an abundance of workshops and short courses presented Thursday and Friday throughout the day. Sessions will provide a how-to of securing government funding, strengthening local food chains, and creating viable and effective programs. Conference sessions will include information on equity in food access, government policy, integration of farm to school into classroom curricula, and how to form collective partnerships. Additionally, there will be presentations on examining the efficacy of programs through data collection, food ethics, and racial equity in food systems. Basically, the sessions and short-courses offer the proven toolkit to create socially responsible, sustainable and successful programs. On Friday choose from an array of field trips throughout the area. An outing with OSU extension will detail research into the nutritional aspects of local foods. At Rothenberg Rooftop School Garden, you can explore a successful urban garden program. Le Soup offers the experience to visit an area non-profit combating the issue of food waste in Cincinnati (Check out our annual printed CORV (eatlocalcorv.org) guide in April for an in-depth look into food waste). There are also several opportunities to visit area farm to cafeteria programs, production farms and gardens, and other integral partners in the local food chain. For those of us who value and understand the importance of supporting the health and wellbeing of our community, this is an amazing chance to gather insight from pioneers in the local food movement. The Ohio River Valley region has the natural resources and vibrant community necessary to propel the local food to institution movement, and the conference affords the opportunity to further existing programs, and create new ones. Haley Shutter recently moved to the Cincinnati area from southern Wisconsin, near Madison with her husband Chase. Professionally, she has worked as a director of a childcare center, developing the nutrition and children’s garden programs. She enjoys volunteering for the leadership board of Granny’s Garden School in Loveland, OH. Her passions and hobbies include: gardening, cooking, and traveling. The RRG program helps to narrow the achievement gaps for the participating inner city children. Besides the integrated lesson plans in math, science, social studies and language arts that align with the state academic standards, the program uses experiential learning opportunities to enrich student’s education, while deepening their understanding of the natural world. navigating in search of tasty local foods, restaurants, and artisans. In my former life, near Madison, Wisconsin, I was already established as a known patron and locavore. I had a vast knowledge of area growers, dined at restaurants where the chefs were my friends, and knew where to purchase the best of the best at the market for my Sunday dinner. Now as I immerse myself into the Central Ohio River Valley culture, I am in search of those same local greats in my food selections and dining experiences. Children all over our region are gearing up to get dirty at school! School gardens, also known as teaching gardens, eco labs, outdoor classrooms, edible schoolyards, etc., are becoming an integral part of daily curricular activities. No matter our age, gender, education, or career choice, we have one thing in common: we all waste perfectly good food. Have you ever left food you’ve been served on your plate (pizza crust or that last bite of cake)? If you answer no, then give yourself a fist bump! Take a closer look at your eating, cooking, and storing habits and I bet you’ll be surprised by the amount of food you actually dispose of, even with the best of intentions. As a matter of fact, approximately 40 percent of all food produced in the United States goes to waste (A Roadmap to Reduce U.S. Food Waste by 20 Percent, ReFED 2016). This startling fact, in conjunction with U.S. Environmental Protection Agency (EPA) and the U.S. Department of Agriculture’s announced goal to reduce food waste by 50 percent in 15 years, has been the impetus to jump start an educational campaign to prevent wasted food. After all, when food is not eaten nearly all of it goes to the landfill where it creates methane, a potent greenhouse gas. In addition, all of the resources that went into planting, growing, harvesting, transporting, storing, and purchasing the food are squandered as well. The EPA has developed this Food Recovery Hierarchy to prioritize action steps we can take to keep food from being wasted. Consequently, the focus of Hamilton County Recycling and Solid Waste District’s educational campaign is the prevention of wasted food as source reduction (reducing the volume of surplus food generated) is the most preferred action. The food we waste is actually surplus food. If we didn’t waste it, we would have more money or be able to share it and feed more hungry people. In fact, the average family of four spends $1,500 on food they never eat! Begin by taking note of what you are throwing away. Before shopping, see what’s left in your refrigerator. Create a weekly meal plan (including dining out). Shop locally and for seasonal produce. Prep ahead: Smart prep is prep now, eat later. Create an “eat this first” area of your refrigerator. Learn to store perishables for longest life. Get educated on the fallacy of expiration dates. More tips can be found at SavetheFood.com. Hamilton County Recycling and Solid Waste District is piloting a Save the Food Campaign with the help of many partners. Perhaps you’ve seen the ads on Facebook or the video “The Extraordinary Life and Times of Strawberry”? Later in the year, we plan to extend our outreach and are developing programming to reach a broader audience. Each one of us is a consumer of food and can decide to take control of our purchases. Beyond the home, many other factors need to be addressed to move the dial in the right direction. Gleaning food from the fields after the initial harvest, educating business owners on the donation protection provided by the Bill Emerson Good Samaritan Act, or training food service workers on proper handling and prepping are a few other important actions. If you are interested in having us set up at your farmers market, would like to participate in a wasted food study or food recovery challenge, or would like to help spread the message, please email SavetheFood@hamilton-co.org. Jenny Lohmann is a Program Specialist focusing on education outreach at Hamilton County Recycling and Solid Waste District. She assisted in planning and development of the region’s first Food Waste Forum and is a devout foodie. Our Region is Ready for an Office of Food Policy – Are Our Elected Officials up to the Challenge? With the upcoming election on the horizon, we have an opportunity to talk with our public officials about the importance of locally produced food. This letter has been crafted to help get the conversation started. When I work with parents of young children, I often tell them they have to teach their children how to eat just like they teach them how to read or how to ride a bike. What I am talking about is not how to use a spoon or drink from a cup but how to eat a variety of fresh, minimally processed foods. I Took the 10% Shift Pledge and So Can You! This past spring I took the Green Umbrella pledge to shift 10% of my food budget to buying local food. And then I wondered, “What have I done?” I had no idea what my food budget was or what it would entail to fulfill the pledge I was making. Now you may be someone who tracks your weekly spending closely, but I definitely do not, and the prospect of figuring out 10% of my budget felt overwhelming. At the same time, I also needed to select a “Personal Life Change” for a class in my master’s program called Issues in Cincinnati Conservation. This assignment required making a change in my lifestyle and determining the associated ecological benefits. The Green Umbrella 10% Shift Pledge was a perfect fit for this project. I would overcome my budget-tracking resistance and turn this into a learning experience to share with others. First step: analyzing my food budget. This actually turned out to be simpler than I expected. To get a baseline, I kept all store receipts and tracked which foods were local and which were not for two weeks. This record keeping took a few extra moments after I put my groceries away. At the end of the two weeks I added up the amount I spent on local foods and the amount I spent on non-local foods. Then I figured out what percent of my total food budget was spent on local items. You could do this by entering the amounts in an Excel spreadsheet or just writing two columns on a piece of paper and using a calculator; it doesn’t have to be complicated. And,(drumroll please!) it turned out that 22% of my food budget was spent on local food. What a relief! I already met the 10% shift pledge! Given my 22% local food baseline, I decided to take the pledge further. If I shifted an additional 10% of my food budget to local food, relative to my current budget, I could set a new goal of 32% local food, and still use this pledge for my school assignment. Which brings us to weeks three and four. For this stage I changed my shopping habits to intentionally increase the amount of local food I purchased. I followed the same process of saving receipts and marking local and non-local items when I got home from the store. Then I added up the columns and found I had increased the percentage I spent on local food to 59% of my budget! Yippee! Ask the manager at your regular grocery store to give you a tour of local food items they sell. Ask them to mark these items for other customers as well so that everyone knows. If they find it hard to locate items to show you, mention that you are a regular shopper who would appreciate more locally-sourced options. Find a farmers’ market near you by searching the CORV Local Food Locator Map. Add the market’s days of operation to your calendar. Note whether they pause in the winter months or move to an indoor location. There is a farmers’ market within a five-mile drive of my house on every day of the week except Tuesday and Friday. By putting them on my calendar I was reminded to make a trip to the market that day if I needed groceries. Buy a share in a Community Supported Agriculture (CSA) program. Not only does this set you up to meet the 10% Shift Pledge, you’ll get a basket of delicious locally-grown produce every week and support a small farm in your community. Find a CSA . Replace some non-local food items you normally buy with local versions. This is easy to do with vegetables in the summer, but year round you can buy local bread, eggs, meats and dairy products. Many small business entrepreneurs are making delicious local packaged foods including snack chips, granola, desserts, fermented veggies and other preserved products like pickles, jams and fruit butters. Look for them at specialty stores, farmers’ markets and ask your grocer to stock them. Specialty stores include: Madison’s Market, Clifton Natural Foods, etc. Try new foods. Whether it is a kohlrabi bulb that comes in your CSA or a jar of kimchee made by a local company, trying new foods can be fun. You might even find some new favorites! Forego some non-local foods. Perhaps they are not the healthiest choices and you have wanted to move away from them anyway. Maybe they are transported an extra-long distance to get to your grocery and therefore have an extra-large carbon footprint. Be sure to check the label for where the food comes from, and note that this is different from where the distributing company is located. Embrace eating local foods when they are in season and find out how much better they taste than their non-local counterparts flown from distant lands. But what do you do if this is too much for your busy lifestyle? If you just don’t have time to track your budget, the Green Umbrella website states if an average family shifts just $12 per week to local food it can meet the 10% shift goal. And, if just 10% of people in Greater Cincinnati shift 10% of their food budget to local food it will result in $52,000,000 infused into the local economy! We are excited to launch our monthly article series starting in July. Our goal is to bring you a wide range of informational, research, persuasive, and opinion pieces related to agriculture and food. We have put together a diverse team of authors, from local chefs and food advocates, to farmers and scholars alike. We also encourage readers to submit their own ideas for possible articles and even responses to what’s been posted. It is our hope that these written pieces will stimulate conversation, informed decisions and even policy making in our region and beyond. Please take a moment and view our submissions to get a sense of what has already been covered. A new article will be uploaded at the beginning of each month. Include at least 1 picture/diagram per every 500 words. Breanna Parker, our graphic designer, will help locate photos. Local shots are preferred, but graphics related to the article are also important. Please use High-resolution photos. Include a list of 3 keywords that describe your article so we can eventually categorize articles. Hyperlink references to keywords for online content. Include all citations at the end of the article as well. Include a short bio (3-4 sentences) and photo (when possible). Article will be posted the beginning of each month, starting July. We will promote via social media. Seeds are the beginning and the end of the life cycle of a great number of plants, and we rely on this rhythm in many ways. Corn, beans and grains are our staple food crops and are seeds themselves. The practice of growing and saving seeds each season ensures the chance to plant again the coming season and perpetuates varieties that express desirable traits like pest resistance, unique color, or large harvests. When we think of buying local food we may picture a bounty of vegetables at the farmers’ market or CSA, but many local farms also produce meat. The average American eats about 200 pounds of meat per year with the vast majority produced on large-scale industrial farms.